St. Roberts, Missouri was the first stop along my 27 hour journey from Illinois to Arizona. I did not intend to stop, since I was determined to drive later into that first night. However, when I was driving along the winding, hilly road at around 11pm, I found myself driving in and out of a thick fog. I would get up to the top of a hill, become blinded by the fog, only to drop down into a clearing. This up and down, in and out, went on for several miles, until I finally decided it was time to play it safe and find a place to sleep for the night. I woke early, refreshed, and ready to start back out on my journey. Driving long distances gives one plenty of time to think and reflect. I thought about that fog, and how I had felt such anxiety while in the midst of it, only to come out on the other end into a place of clarity. As the fog was in my rear view mirror, I had felt such a sense of relief and peace at having come out of it. Such has been my life. How many times have I felt the anxiety of the unknown, the fear of what I cannot see in front of me? Eventually, after each fog in my life cleared, I would have that same sense of peace at having made it through. The fog never lasts forever. Yet each time I have found myself coming out of one, I feel that I have grown stronger for the experience, with lessons learned along the way. 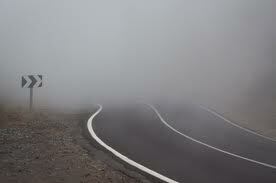 The knowledge that this too shall pass never seems to be enough when you are in the middle of a fog, vision impaired. However, once you come out of the other side, there is a sense of strength and accomplishment. So for now, I am happy to be in a place of clarity… at least until the next fog arrives. But then, this too shall pass! Thanks for your comments! I apologize for being so delayed in responding. It has been quite a journey!